Copaxa sophorina | Welcome, visitor! Copaxa sophronia is a Copaxa species from Central to South America, including Mexico, Honduras and Guatemala. While the adults are not remarkably colourful, the larvae certainly are. Special notes: Not much is known about the biology of this moth in the wild, including natural host plant and peak flight times. The adults are not colourful but have a lot of variation, from grey to brown to yellow. Copaxa sophorinia eggs hatch in about 2 to 3 weeks time. The young larvae are social and live and in groups together, but the mature larvae become solitary. 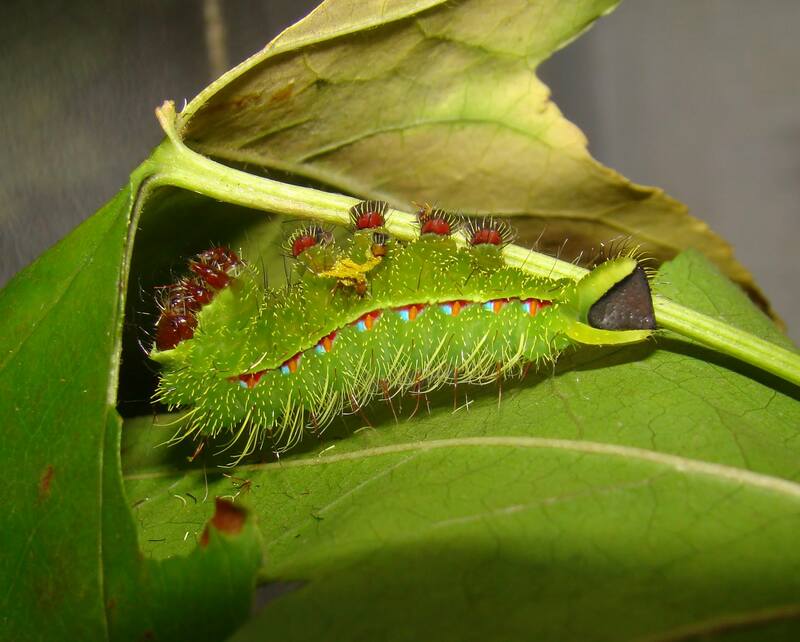 Unfortunately, while there isn’t too much known about their host plants in the wild Copaxa sophorinia will readily accept Liquidambar and Persea americana in captivity – two host plants that are favoured by many Copaxa species in captivity. The mature larvae of Copaxa sophoronia have beautiful colours, namely the spiracula that are bright orange and accompanied with a blue dot and red markings and the bright red prolegs of the larvae. If disturbed, the larvae will vomit and spew out their gut content; handling them often results in a sticky mess. Thus it is not advised to handle or stress the larvae too much: not because it is harmful to the handler, but because it can negatively impact the health of the larvae themselves if they are forced to regurgitate the contents of their stomach too often. A Larva of Copaxa sophorina nearly ready to pupate! Copaxa sophorina spin thick and double-layered cocoons that are also very porous due to the holes in the silk; such type cocoons are very typical of Copaxa sp. – the cocoons generally emerge within a few months time. As Copaxa sophorina is continuously brooded, expect to have quick emergences after about 1.5 month. The pupa is wine red to orangeish, gradually turning darker as the moths develop. 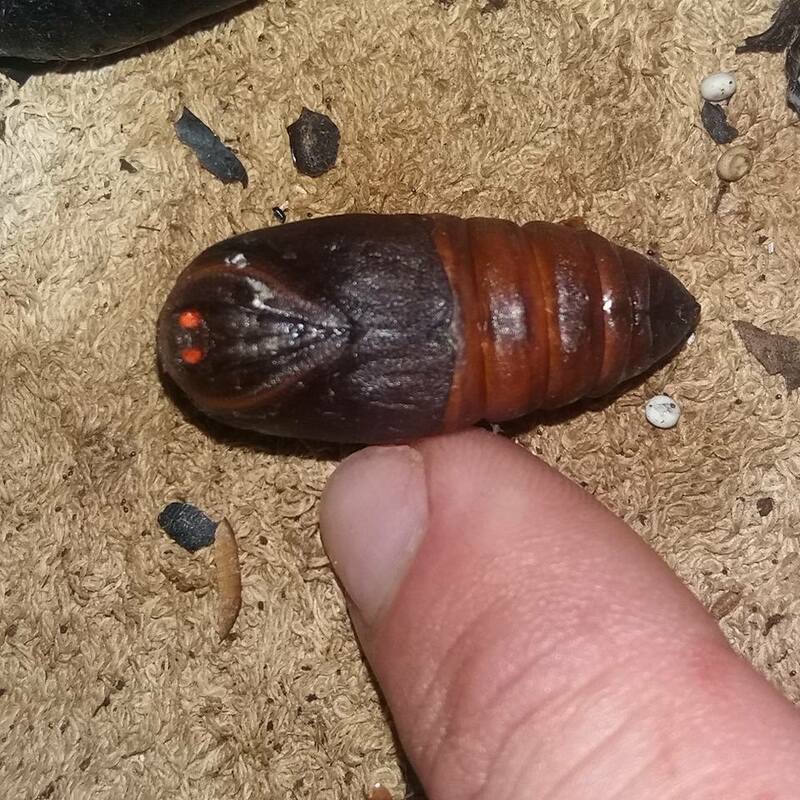 The pupa of Copaxa sophorina before emerging; look at those eyes! The adults of Copaxa sophorina are easy handpaired due to the very large claspers of the male. Interestingly I failed at getting any natural pairings; perhaps because the moths were related and didn’t pick up on eachothers pheromones, or simply because they lacked proper ventilation. Whatever was lacking for the moths to pair naturally; the species is very easy to handpair, so this was not an obstacle in breeding it.